Donald E. Fahnestock, 92, of Mt. Holly Springs, PA, passed away Monday, January 21, 2019 in his home. Born September 11,1926 in Mt. 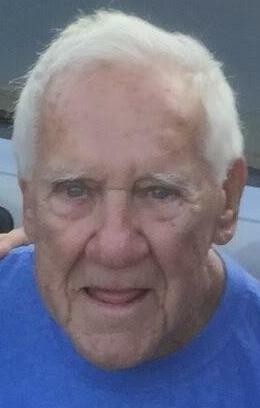 Holly Springs to the late Ellis Quay and Maude Strohm Fahnestock, he was predeceased by his wife, Ada M. Fahnestock who passed away January 12, 2014 and his son, Kirby L. Fahnestock who passed away April 12, 2015. Donald retired from the former Masland and Lear Corps. as a pipe fitter. Memberships included: Kettle Creek Sportsman, Mt. Holly Springs Fish & Game,Upper Adams Fish & Game, Eagles Aerie # 1299 and life member of the VFW Post 7343, Mt. Holly Springs. A Navy veteran of WW II, Donald proudly served on the Naval Ships USS Sangamon and USS Gilbert Island. He is survived by his son, Bradford E. Fahnestock of Mt. Holly Springs; two grandsons, Quay Ellis Fahnestock of Dubai, United Arab Emirates and Cory Fahnestock of Mt. Holly Springs; and Don’s companion Marie Kuhn of Mt. Holly Springs. Also surviving are his siblings, Phyllis Lowe of Willow Street, Lancaster County,David and Duane Fahnestock, both of Palmyra and Max Fahnestock of Mt. Holly Springs. A Celebration of Life Service will be held on Saturday, February 2, 2019 at 11:00 AM in the Mt. Holly Springs Church of God with Rev. Dan Murray and Rev. Richard Reese officiating. Interment will be in the Mt. Holly Springs Cemetery at the convenience of the family. Memorial contributions may be made to the Mt. Holly Springs Church of God, 602 McLand Rd., Mt. Holly Springs, PA 17065 or to the Upper Adams Fish & Game, C/O Ike Williams, Treasurer, 102 Town Hill Rd., York Springs, PA 17372. Visit www.hollingerfuneralhome.com for condolences to the family. Arrangements are being handled by the Hollinger Funeral Home & Crematory, Inc., Mt. Holly Springs, PA.